Since the beginning of his work in the field of modern art, Andrei Nakov has given particular attention to the study of the origins of abstract art (Master’s thesis on the creation of Mikolaj Ciurlionis at the University of Warsaw, published in Paris in 1967) and logically to the works of Wassily Kandinsky (research at Columbia University under the direction of prof.Meyer Shapiro). 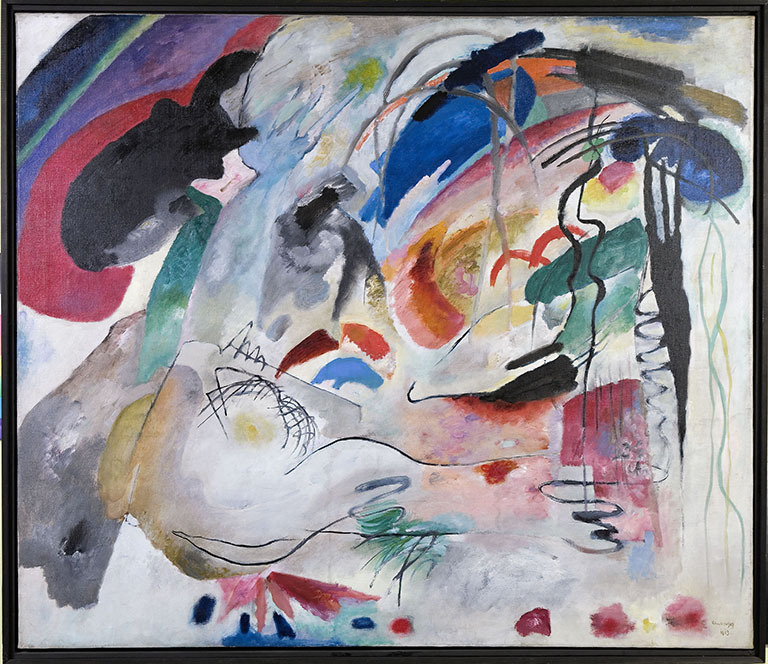 At the end of the 1960s, Nina Kandinsky entrusted him with the French translation of Wassily Kandinsky’s manuscript, “Violette”, which appeared in the French collection of Kandinsky’s writings published in Paris by Les Éditions Denoël. Subsequently, by recommendation of his dissertation advisor, Prof. André Chastel, he edited in 1968 the entry “Kandinsky” in the Encyclopaedia Universalis. The difficulty of accessing archival materials in Munich was the main obstacle in further work as was the scarcity of texts on the subject; one exception was a supplementary chapter to the Russian edition of his book Abstrait/Concret (Bezpredmetnyj mir, Moscou, ed. Iskusstvo, 1997). In 2008, he published an article devoted to the “Composition n° 6” in the catalogue of the exhibition, Traces du Sacré (Musée National d”art moderne, Centre Pompidou, Paris 2008, p.154 and ff.). At the beginning of summer 2011, the Pinacothèque de Paris requested him to participate in the organization of the exhibition Expressionismus & Expresssionismi (13 October 2011 – 11 March 2012). Thanks to his contacts, presented at this show were works rarely exhibited in Western Europe such as the first abstract painting by Kandinsky “Painting with a Circle” of 1911 and “Improvisation 34” of 1913, on which Andrei Nakov devoted his text to the exhibition catalogue. Furthering his work on this subject, he is currently researching certain aspects of Wassily Kandisnky’s works in view of a larger publication concerning the origins of Kandinsky’s first abstract works as well as the artist’s relationship with music – a fundamental subject for the beginnings of abstract art for artists such as Kandinsky, Malewicz or Kupka. For many decades Painting with a Circle — inscribed on the back “first non-objective painting” and dated “1911” — was not only hidden from the public, it also eluded art history. 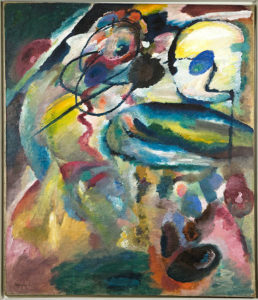 In the mid-1970s a photograph of the painting, kept by the painter Sergei Bobrov, Kandinsky’s assistant in Moscow during the “revolutionary” years, fell into the hands of the collector George Costakis. This photographic document allowed Painting with a Circle to enter the chronicles of art history, although the whereabouts of the original were as yet unknown at the time1. The work itself finally appeared in Moscow in 1989 at the first Kandinsky retrospective organized in the memorable year of the fall of the Berlin Wall. The painter’s attachment to this work remained constant throughout his life. 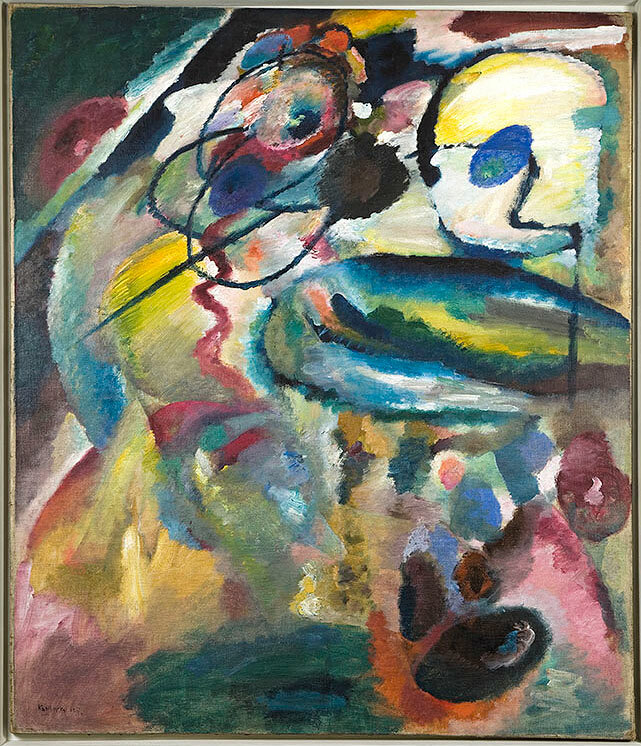 During the 1930s, at the first attempts in Western Europe, and especially in France, to establish a, by then, historical appraisal of the appearance of abstract art, Kandinsky, at the request of Christian Zervos2, was busy trying to obtain information about his “first abstract painting” left behind in Moscow. “It is a large painting, almost square, with very animated shapes and a large circular shape at top right…at the time I was not satisfied with the painting, that’s why I didn”t number it, and I didn”t even note it down in my private catalogue” he wrote in 1935 to the gallery owner J.B. Neumann3, also asking him “if it would be possible to obtain a photograph of the painting” which would make him “very happy”. The comments Neumann was provided with explain why the painting does not figure in the various “Handlist” (or “Hauskatalog”) : Kandinsky “was not quite satisfied” with this painting, but he nevertheless acknowledged its historical place in the evolution of his oeuvre. The inscription on the back of the painting reveals the historic moment generated in Russia by the first evaluation of abstract/non-objective creation. In the late summer of 1919 this appraisal was initiated in Moscow with the show Non-Objective Creation and Suprematis4, planned as the Tenth State Exhibition, an official exhibition organized by the Department of Visual Arts (IZO) within Narkompros (according to the terminology of the time, the Ministry of Education). Marking a pause in the evolution of non-objective and/or abstract art in Russia, this exhibition was preceded by a series of turbulent meetings during which opposing groups at the heart of the non-objective movement manifested themselves. Having become, according to Malevich’s critical definition (1918), “formalist” and “illustrative”, these opposing groups gradually turned against Malevich’s Suprematism, an explicitly idealist tendency, which as a result was beginning to be openly confronted by the materialist-formalist upsurge, an orientation which would shortly be labelled “Productivist” and later, “Materialist-Realist”5. Although rejected by the faux-modernists and at odds with the Cubo-Futurist avant-garde, Kandinsky persevered. Thus his presentation for the 1914 Spring Exhibition was no less ambitious and expressive than his show at Herwarth Walden’s Herbstsalon (Autumn Exhibition) in Berlin in autumn 19136. In Odessa in April 19147 he showed five paintings, namely Composition VII, undoubtedly a significant work, the extraordinary Painting with White Lines of 1913, mentioned above, Painting with a Circle of 1911, a “Landscape” dated 1913, and the major Improvisation 34 of 1913, which for stylistic reasons can be closely associated with Painting with a Circle. Apart from his participation in the Berlin Herbstsalon, no other Kandinsky exhibition of the time possessed this ambitiously conceptual quality. It is therefore undeniable that, despite all the obstacles, Kandinsky wished to proclaim in Russia the major premises of his creation. A year later Kandinsky used a similar selection for the Moscow exhibition “The Year 1915”. Kandinsky, l”énigme du premier tableau abstrait, ISRA Publishing, Cracovie, 2015, 248 pages, 86 ill. coul. et n&b, 200 × 257 mm, reliure cartonnée. 1. ↑ An illustration of this painting and some fragmentary (and occasionally erroneous) information were published for the first time by Hans K. Roethel and Jean K. Benjamin in “A new light on Kandinsky’s first abstract painting”, Burlington Magazine, no. 896, vol. CXIX, London, November 1977, no. 772. Information — including the photograph kept by Kandinsky’s assistant Sergei Bobrov — gathered at the time (especially the incomplete chronology of the exhibitions, see esp. the approximate dimensions), appear in this form in the Catalogue Raisonné of Kandinsky’s paintings published by H.K. Roethel and J. Benjamin in 1982 (Ithaca, NY: Cornell University Press, vol. 1, no. 405). Shown at the last major retrospective of the artist in 2008–2010 (in Munich, Paris and New York), this painting was not accompanied by an adequate commentary (see the catalogue Kandinsky, Paris : Centre Pompidou, 2009, text p. 78, illus. p. 79). It was limited for the most part to information given in the Roethel and Benjamin 1982 catalogue raisonné. Painting with a Circle did not even figure in the 2006 retrospective at London’s Tate Modern, despite the fact that the exhibition was entitled “The Path to Abstraction”. 2. ↑ See the “research” devoted to abstract art for his review Cahiers d”art. 3. ↑ This letter is dated 4 August 1935 and is kept today in the archives of the Getty Foundation in Malibu, California. It was first quoted in English translation by H.K. Roethel and J. Benjamin, op. cit. 1977, and later in French translation by Jelena Hahl-Fontaine in her book Kandinsky, published by Mar Vokar (Belgium), 1933, p. 181. Three years previously, Jelena Hahl-Fontaine had published a short study of this painting (“Kandinsky’s erster abstraktes Ölbild 1989 widergefunden” in Kunstchronik, Munich, March 1990, pp. 95–103). J.B. Neumann, Kandinsky’s dealer in New York and a former gallery owner in Munich and Berlin, was preparing a trip to Moscow, which explains Kandinsky’s request. In the letter, the artist quotes the dimensions of the painting from memory : “about 200 x 150 cm”, much larger dimensions that the actual size of the work, a detail that emphasizes the — also physical —importance that Kandinsky attached to it. Not having seen the original, H.K. Roethel gives these dimensions in his 1982 catalogue raisonné. 4. ↑ Due to various obstacles, both material and conceptual, it did not open in Moscow until the end of March 1920. For more details see my book Malevich, Painting the Absolute, London : Lund Humphries, 2010, Vol. 2, esp. chapter 21. 6. ↑ For this truly international exhibition Kandinsky showed seven major paintings, including Composition VII, Painting with White Border, Improvisation 31, Painting with White Form andtwo sketches for the first two. 7. ↑ Officially, the exhibition lasted from 25 March until 27 April. Inspired by Izdebski who circulated his exhibitions to various Russian towns, the organizers of the 1914 event announced at the opening that “from 10 May the works will be shown in Kiev”. See the announcement in the newspaper Odesskie novosti (The Odessa news) of 28 April 1914. The project, however, never came to anything.